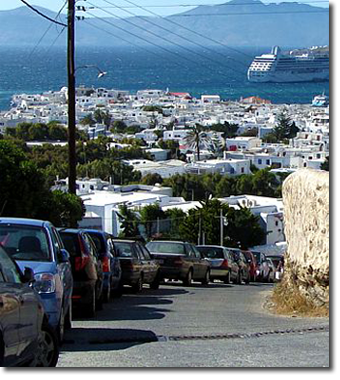 Always keep to the right-hand side of the road when driving in Mykonos and all over Greece. | If you need to contact any emergency personnel, the emergency phone number across Greece is 100. In Mykonos the phone number for the police department is (+30) 22890 22482. | It is not necessary to turn on daytime running lights. | Remember that in Mykonos, the car entering a roundabout has to stop. The cars inside the roundabout have priority. According to the new driving regulations effective from May 1st 2018 an International Driver’s Permit from your home country is mandatory in order to drive in Greece. This directive does not apply to E.U citizens with European drivers licenses. | This must always be carried when you are driving your car hire, in addition to a driver’s license issued by your home country. To drive an Action rental car, drivers must be at least 21 years of age. | Some rental car agencies will not rent vehicles to persons under the age of twenty-three and others will for an extra fee. | In addition, some rental car agencies will not rent vehicles to drivers over the age of seventy. When driving anywhere in Greece, all passengers must wear their seatbelts, especially the two seated in the front. | Not wearing a seatbelt is grounds for an expensive fine and bad for your personal safety. | All motorcyclists must wear safety helmets when driving. Drinking and driving is never a good idea, period. | The maximum legal alcohol limit is 0.5mg per ml. | The police don’t need ‘probable cause’ to stop your vehicle and breathalyses you. They’re permitted to make random stops and checks, so you could easily find yourself stopped unexpectedly | It is better to stay on the safe side and abstain from drinking alcohol if you intend to drive. If you happen to get into an accident with your Action rental vehicle, do not leave the scene. |Stop the car exactly in the place where the accident took place. If this is not possible, leave a mark at the spot so that to inform the authorities for the exact location. | Do not accept any responsibility and give us a call to come help you out. | It is illegal to leave an accident without informing the police.